AZART, the Center for Cultural Projects aims to contribute to increasing the quality of contemporary art in Moldova by creating a unique artistic platform where talented young artists are supported. Oksana Buga, President of AZART, comes with tips and lessons learned during 5 years of activity. Our mission is to develop and promote contemporary dramaturgy by organizing workshops for local playwrights and artists. We started from us, because we felt the lack of qualitative performances based on contemporary plays. That is why, everyone can apply to our writing workshops, not necessarily artists in the field, so we offer equal opportunities and discover talents outside of academic institutions. When you start writing a project, you don’t write what you like or how brave you are. First of all, you need to come up with arguments why this project needs to be implemented. That's why you need to do good research. You must have a well-established statistic. For example, if the field is to promote independent theater, then you should be interested in how many independent theaters work in Moldova, how much contemporary drama is mounting annually, or how much money does the Ministry of Culture allocate for one person for culture per year? After an elementary calculation, in Moldova, the ministry allocates about 17 euros per person per year. I'll let you decide if it's little or too much. ● Find out what everything you can about the sponsors. What is their mission? What are they emphasize and use it for your benefit. ● I recommend, in the beginning, to appeal to both, local and foreign institutions. Because usually, the local ones give the money after the project is completed and the foreign ones give at least 80% of the total amount before the start of the project. In this way, you ensure the minimum necessary to carry out the activities and the rest of the money returned at the end. Local institutions have a particular issue. I have never met the practice of giving money at the end of the project, as the Ministry of Education, Culture and Research and the Department of Culture of Chisinau have done this for a few years. They want small organizations to work for free and buy services on debt. That's why many small NGOs do not resist, because there's a lot of work to do for free, and if you're not excited about it, then you choose another job to feed yourself. ● Consult the Culture Development Strategy2020, developed by the Ministry of Culture. From there, you get figures and statistics to help you justify the importance of your project. ● SMART- the nightmare of any cultural manager. It deciphers as: specific, measurable, assigned, realistic, time-bound goals. All this must be included in a sentence. My advice is even if you do not apply for funding, it's good to have SMART. ● Budget is the most important part. Remember that each project has unexpected costs, some organizations even have such a category in the application form. And don’t forget about taxes. Never forget about taxes! ● When you write the project, never write ambiguous formulations in the future: "Hopefully, we think we want it, and so on". NO, wrong! The project requires concrete facts. Maybe you still don’t think you will succeed, but on paper, everything has to look concretely and with confidence. ● If you write a lot, it does not necessarily mean you are writing well. Better a little, but what you need. Learn to cut it off. The financiers like short, clear and comprehensive applications. And leave your talent of a writer for FB posts. ● Usually, the same audience goes to national theaters. Our purpose? The public must be raised and educated. Don’t just do what he likes, but bring the audience to what you do, raise him to another level, offer alternatives, give him something new. Physicians say that in order to have a healthy body, nutrition needs to be diverse. The same is true of cultural life: it must be diversified. In the top of the "Human Capital Index", Moldova is on 71st place. Moldova needs to invest in culture, education, and health if it wants a quality of high life. ● Communication with the press and social networks. Media partnerships are important. You have to become the ambassador of your project. Because people believe in people, not in organizations. For example, if someone is accessing my FB profile and there she/he sees only posts about cats and culinary recipes, but nothing about art and culture will seem a little bit strange. ● No one works for free, everything has to be paid. In this way, responsibility also arises. ● Team communication. It is very important to share the tasks correctly and efficiently. ● Care for guests: from accommodation and menu to meeting and driving to the airport. ● For each budget change that appears, notify the financiers. Paper Management is a special art. If you are a man who knows how to put your bills, payment orders, etc. in order, you are a lucky man. ● Non-formal communication is important. You have to make sure that participants and mentors have time and space for communication. If you go out for a beer or tea with participants/mentors, you “risk” to make yourself with a partner or even friend. ● When you start the project, do it as you do it for yourself. It's simple. Would you like to drink soluble coffee in a plastic bottle, or just a whole week eat only biscuits? Certainly not! Spend a little more, but you’ll know that people you care about are happy. ● The most important tip is: just do it! You can’t know what you can and can’t do until you try. ● has to be a bit naive. Too much pragmatism doesn’t do well. At first, there must be some kind of adolescent enthusiasm. ● Perseverance. When we started to register the organization, the Ministry of Justice staff was already greeted by color when they saw me, because I was coming very often. ● You have to find the middle of gold. Money and art. "Artist must be hungry". I do not agree with this, I don’t know who invented it, sure they were not artists ... In my opinion, it's easier to build a house than to write a good play. ● 2 editions of the International Contemporary Dramaturgy Festival “Verbarium”, Focus Workshop Chisinau, a series of activities dedicated to art education, 10 contemporary drama workshops with local and international facilitators, numerous reading shows, theater and writing workshops in rural areas, the first performance-reading based on contemporary Moldovan dramaturgy, conducted in Tiraspol with non-artists from the Transnistrian region and Chisinau. ● We are the only ones who work with "non-professional" playwrights, people from any field (medicine, IT, painting, etc.) who like to write and do it well. 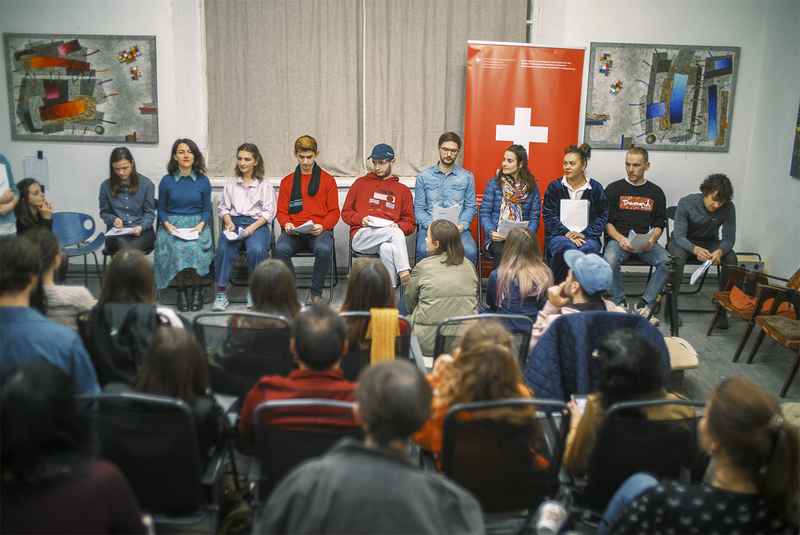 ● In 2018, we received funding from the Swiss Agency for Development and Cooperation in Moldova, the German Cultural Center Akzente, the Ministry of Culture of Moldova and the Cimişlia City Hall. Thanks to these funding, we managed to organize the first edition of the Contemporary Drama School. ● We managed to collaborate with the Rimini Protokoll Theatrical Company in Germany, a world-renowned group performing theater-specific projects (site-specific performance) taking place anywhere, in a bar, on streets…etc. It's a big and expensive project. If we manage to bring it to an end, we invite you to the Chisinau Remote Prize in spring. ● Multitasking: Members of our team are doing what is best about it and even more. Starting with project thinking and writing, budgeting, communicating with partners, financiers, artists, participants, the media, preparing space for projects, logistics. We are not afraid that the job of cultural manager will disappear over the next 20 years :). How can the region get tourists interested, apart from the usual sights?